Rats are intelligent creatures, and as pets, they live happier lives when presented with challenging play opportunities. You can give your rats the mental stimulation they need by constructing a rat maze out of boxes and other cardboard materials you most likely have at home. While these mazes aren’t as durable as their plastic counterparts, they make it easy to give your rat a new challenge often. To build a maze, you’ll need a large, flat cardboard box, some extra cardboard pieces, a roll of packing tape, scissors and a measuring tape. You should also grab a pencil and paper, so you can design your maze in advance. Once you have a design, measure lengths of cardboard for the walls, then cut and tape them into place. To prevent your rat from escaping, you can secure wire mesh, available at most hardware stores, over the top. This will also allow you to watch your rat as he attempts to find the end of the maze. Before making a maze with movable walls, you don’t necessarily need to create a design. Instead, cut walls in a range of lengths. Then, cut notches at both ends of each wall. These notches should be just the thickness of the cardboard and run vertically, each stopping one-fourth of an inch from the top of the wall. Places the walls in the box by using the notches to secure them together. After your rat learns each layout, remove the walls and create a new pattern. Give your rat a chance to explore in this variation on plastic tunnels. Find five or six cardboard boxes in small and medium sizes, some toilet paper and paper towel tubes, a roll of packing tape and some scissors. Cut tube-sized circles in the walls of the boxes and tape the tubes in place. You might begin with an easy shape, like a square, then add offshoots and upper levels. Place your rat in one box and some food in another, and let the rat find his treat. If you’d like to see your rat in action, cut a few windows in the boxes; cover them with wire mesh so the rat can’t escape. Rats are easily motivated by food, so add pungent treats to the end of your maze and let your rat follow his nose. 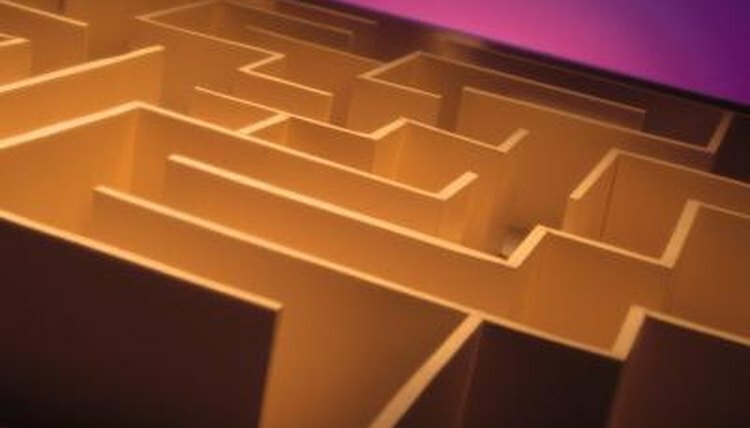 To make your maze more interesting, you might add obstacles, such as shredded paper, small balls, climbing ropes or blocks. Remember, though, that you’ll have to watch your rat to ensure he doesn’t ingest pieces of your building materials. Water obstacles, such as shallow pools, can also provide fun, but because water makes cardboard soggy, your maze might need reconstruction after one or two uses.